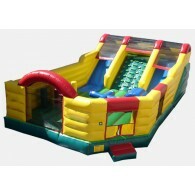 Our wide variety of commercial inflatables are great products for any rental business, church, organization or just for years of family fun. 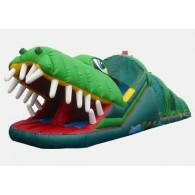 If you have a business that rents inflatable bouncers, you know how important it is to find quality products that will stand up to a lot of use, without spending affecting your profit margins. 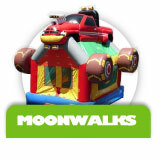 At KidWise, we offer only those commercial inflatable bouncers that are made with quality material and construction and sell them at outlet prices. 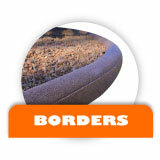 We also offer a great variety so that you have more options for creating a diverse inventory that offers a good choice for every customer and every occasion. 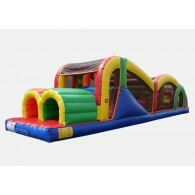 Another step up from the basic inflatable bounce house are our inflatable games and obstacle courses. 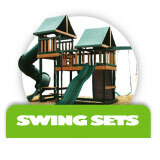 These bouncers give kids a place to run, play, jump and climb to their satisfaction. 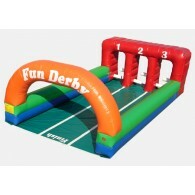 The inflatable games and obstacle courses are a great way for daycares, churches, and other child-oriented places to provide children with the healthy fun they need. 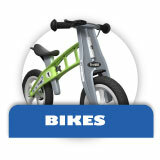 Instead of staying indoors, children will get the fresh air and exercise that keeps them healthy and happy. 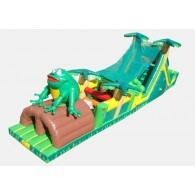 The Western Toddler Game is a commercial inflatable that provides the ideal place for little ones who are always on the go. 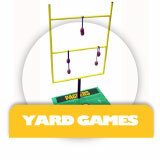 Just provide the adult supervision and the kids will do the rest! 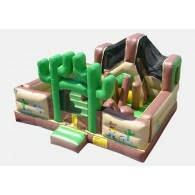 From the cacti doorway to the drawings of cowboys, it is filled with western appeal that will spur their imagination. 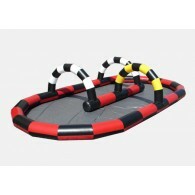 The Race Car Toddler Game is another commercial inflatable that is designed for the smallest player. 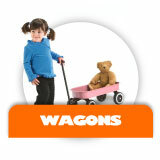 All kids are certain to love the inflatable cars! 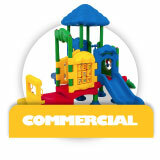 It’s a great place to play while keeping them safe and happy. 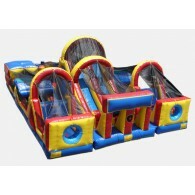 Other choices in Toddler Games include the Jungle and Ocean designs that are designed in bright colors and adorable graphics. 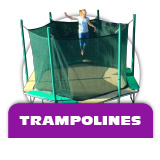 All of our toddler games are designed to help you care for the little ones and keep them entertained for hours without the worry of them getting hurt. 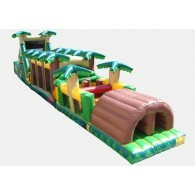 The Tropical Themed 3 Piece Obstacle Course is the perfect commercial inflatable to add to your rental business. 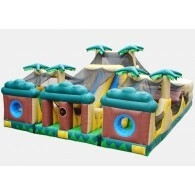 Kids can race around with their friends and jump, climb, and weave their way through the creatively designed course that is surrounded in palm trees! 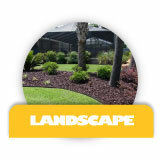 The three pieces of the course can be separated so that they can be used individually or you can keep them together to use at the same time. 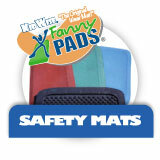 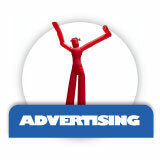 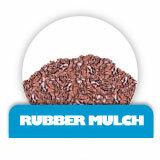 It’s made from high quality 18 ounce PVC vinyl that is tough enough to use year round. 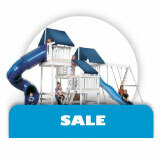 Its dimensions of 37’ x 28’ x 15’ make it an ideal choice for those occasions where there will be lots of kids to play! 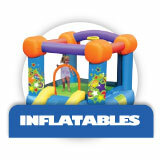 Our commercial inflatable inventory includes many sizes, styles and options in inflatables so that we offer everything you need for your business or facility. 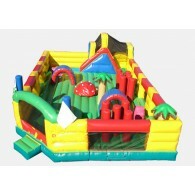 Uniquely different items like the Tropical Obstacle Challenge with water mid section, combined with quality construction and discount prices make us an excellent resource for you. 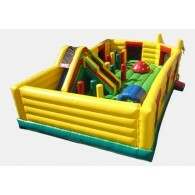 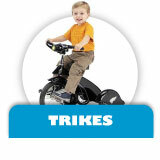 Bouncers are a popular draw for kids at any event and they are also a good way to keep kids moving and happy! 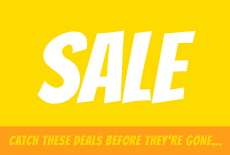 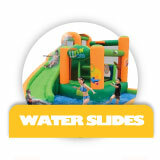 From the simplest houses to the most elaborate obstacle courses, water slides, and water parks, we have the selection to provide you with all the inflatables you could want!